At the beginning of the official police investigation into the murder of Martha Moxley, Michael Skakel was not a strong suspect. According to some sources, he was ruled out almost immediately due to what was then perceived as an air-tight alibi, substantiated under polygraph by a number of eye-witnesses. Some feel Michael and other suspects were not thoroughly examined at the time, due to a somewhat premature conviction, on the part of local authorities, that Tommy Skakel was the murderer. It was only later when the spotlight of serious scrutiny was placed directly on Michael. His arrest on drunk driving charges in 1978 probably did as much as anything to renew the police's interest. Michael, at the time, was plagued with serious emotional problems, living, by many accounts, a reckless and drug-fueled existence. What gradually emerged, from that point forward, was a portrait of a deeply, and somewhat enigmatically, troubled young man. In this light, and during the course of Sutton Associates' investigation, serious questions and unresolved issues have been raised about Michael and the murder of Martha Moxley. At the very least, it is fair to say Michael Skakel has, for whatever reason, often acted out in ways certain to arouse suspicion. Reportedly, Michael once even confessed to the murder of Martha Moxley in a therapy session while a patient at the Elan treatment center. He quickly recanted. It soon becomes obvious that there are many ominous parallels between Michael and his brother Tommy. Michael Skakel, as you will learn, has also made some revelatory alterations and amendments to our prior account of his activities and whereabouts on the night of October 30, 1975. As mentioned earlier in this report, Tommy and Michael have both suffered from remarkably similar mental and emotional disorders, and their early relationship was distinguished by an intense, exceptionally explosive rivalry. As Thomas Sheridan has written, in a digest of Anna Goodman's Elan report on Michael, "both boys are impulsive personalities. Both have very poor ego development and a bad self image. Both are sexually immature and blocked emotionally. Both have an alcohol and possibly drug problems. Both are very likeable and outstanding athletes. Both are lost, personally disorganized and have no life plan. Their only point of departure is in the fact that Tommy feels loved by his family and Michael does not." Thomas Sheridan also noted being informed by Mr. Skakel that, "Julie is frightened to death of Michael," and that Michael suffers from enuresis (bedwetting), and has engaged in some transsexual behavior. In more than one sense, these two acrimonious brothers share a unique category of suspicion. 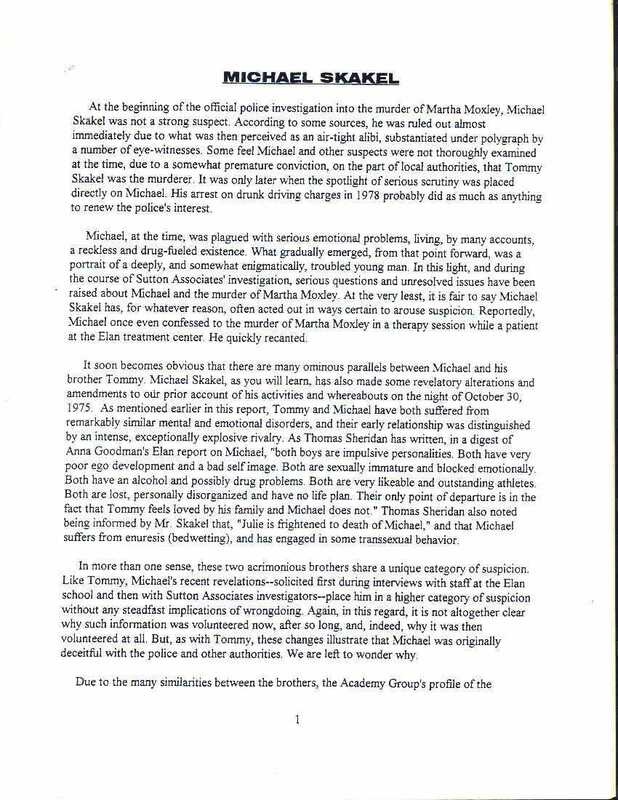 Like Tommy, Michael's recent revelations--solicited first during interviews with staff at the Elan school and then with Sutton Associates -- investigators--place him in a higher category of suspicion without any steadfast implications of wrongdoing. Again, in this regard, it is not altogether clear why such information was volunteered now, after so long, and indeed, why it was then volunteered at all. But, as with Tommy, these changes illustrate that Michael was originally deceitful with the police and other authorities. We are left to wonder why.